Just like I did, I’m sure you’ve head of COST and the COST actions many times. COST stands for European Cooperation in Science and Technology and is a funding organisation supporting the creation of research networks called COST actions. When reading about COST a few things stand out: it offers open spaces for researchers to collaborate and has a bottom up approach, meaning that the researchers are the ones setting up the collaboration networks based on their interests and expertise by submitting a proposal to the COST Open Calls. In addition COST actions are highly interdisciplinary and open, multi-stakeholder, often involving the private sector, policymakers as well as civil society. So many things in common with the vision and work of the Research Data Alliance, I thought. And little did I know before joining the COST “Sharing is daring?” workshop held Brussels, the 13 to 14 March. It turns out that not only the vision and approach of the two is convergent, they cater to similar needs and communities and are constantly working on innovative ways of engaging early careers and senior researchers focusing on specific disciples or cross-disciplinary aspects. 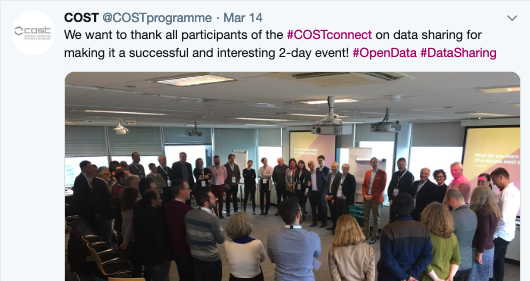 The event was entitled “COST Connect on data sharing – Sharing is daring?” and its goal was to bring together COST actions and other stakeholders such as the RDA or the BDVA to discuss data sharing challenges and approaches across disciplines, activities, types of organisations and countries. As you can imagine there is also a multitude of data challenges that I’ve discovered the two organisations and communities have in common. I’ve learned about very specific challenges about data for transportation, social sciences surveys, health or seismic data and have discussed about the different incentives for researchers make their data FAIR and what are the costs or barriers involved. It was encouraging to see that there is willingness to promote the FAIR principles and practices not only on the side of the researchers but also on that of the funders, who are themselves looking for the best ways to incentivise FAIR data, open data where possible, and in general open sharing practices. Many of these are issues that RDA is working on under one facet or another and supporting the knowledge exchange between the two communities is possible and should be more actively encouraged and facilitated. COST actions are open and can be joined at any time. To do that one needs to simply browse the list of actions to view the selection of relevant ones (https://www.cost.eu/cost-actions/browse-actions/) similar to how the working and interest groups function https://rd-alliance.org/groups. It is all about building the bridges, social and technical, that allow data sharing and more widely the sharing of research outputs “Dare to share!” join the programme and working groups and help build the right bridges. There are 0 comments on "COST programme and the RDA – Dare to Share".